Roses have become the perfect means for expressing our love and appreciation to someone special. Over the years, the development and refinement of the language of roses has led to the association of many occasions with different kinds of roses. It is most often the color of the rose that determines its corresponding occasion; however, other factors such as the number and type of roses should also be considered. With all of the different colors and types of rose arrangements available, there is a match for practically any occasion. The obvious choice for romantic occasions is the red rose. Red roses have become the ultimate symbol of love and are ideal for occasions such as Valentine’s Day, an anniversary, or whenever we want to say “I love you.” The relationship between red roses and romance is one of the most enduring and familiar traditions in the floral community. Sending one dozen red roses will convey a clear message of love. Love and romance aren’t the only reasons to send roses. There are a multitude of other important occasions for which roses are a wonderful gift idea. Here are just a few more examples. White roses are traditionally associated with weddings. Also known as the bridal rose, the white rose symbolizes the unity and purity associated with a new bond of marriage. Bridal bouquets are often comprised of white roses, and many ceremonies will feature a white rose motif. In addition to being a great way to send happy birthday wishes, a bouquet of roses can make a beautiful centerpiece for a birthday party. To celebrate a birthday, yellow roses or an assortment of multi-colored roses are often given. On Mother’s Day, a big impression can be made by sending Mom a bouquet of her favorite color roses. Mother’s Day Roses are an ideal way to show how much appreciation we have for everything that our mothers do. Roses are a time-honored symbol for appreciation, and any rose can be used to say thank you. However, according to traditional rose meanings, a message of gratitude is specifically conveyed by dark pink colored roses. To say get well, or to brighten someone’s day, cheerful and vibrant colors are usually selected. A colorful bouquet of roses can be just the thing to lift someone’s spirits and let them know that they are being thought of. For expressing sympathy, soft muted colors are the most appropriate. White roses are often used to represent honor and reverence. Pale pink roses are another traditional way to convey a message of sympathy. Roses have been used for centuries as a way to express our deepest emotions. As more and more new types of roses have been introduced, more complex meanings have been attributed to them. Today, with the wealth of rose varieties and colors to choose from, there is virtually no limit to the kinds of occasions they can be used for. Roses can be used to say thanks or congratulations, or to express our love and sincerity toward those we care about. With so many different options, selecting the right roses can sometimes be a challenge. However, it helps to keep in mind that more often than not, a bouquet of roses will be appreciated for the spirit of love and thoughtfulness in which it is given. Houseplants add color, beauty, and life to our homes, but some should be grown with a little extra caution. Poison-proof your home today with our list of some common poisonous plants. Have no fear of growing plants in your home; most are perfectly safe. But if you have inquisitive children and pets who may want to chew or crush plants, there are a few varieties to avoid: the handful of plants that can cause allergic skin irritations, stomach upsets, or worse. Some plants are more toxic than others. The good news is that most must be consumed in large quantities to cause any real damage. 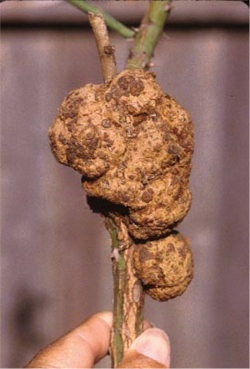 Often the bitter taste repels a child or pet and stops them from ingesting much of the plant. Use care when growing and displaying these common poisonous plants in your home. This is not a comprehensive list; contact your local Extension Service for more information. (Narcissus selections): Many spring bulbs, including hyacinths and daffodils forced for indoor blooms, are toxic if eaten by humans or pets. Eating the bulbs (which can be mistaken for shallots or onions) can cause intense stomach problems, high blood pressure, irregular heartbeat, and even death. (Dieffenbachia selections): This popular houseplant grows in low-light conditions. It’s earned one of its common names, dumb cane, because of the symptoms that occur when it’s eaten. The sap causes the tongue to burn and swell, enough to block off air to the throat. It can be fatal to both humans and pets if ingested in large amounts. (Lilium longiflorum): Cats have been known to suffer serious damage after eating Easter lilies. Eating small amounts of any part of the plant can lead to a cat’s death from kidney failure if not treated by a veterinarian within 18 hours. The plant is not poisonous to children, but they can choke on pieces of it. (Hedera helix): Large quantities of ivy must be ingested to cause serious problems, but all parts of English ivy can cause symptoms that include skin irritation, burning throat after eating the berries, fever, and rash. (Nerium oleander): All parts of oleander, a popular indoor flowering shrub, are extremely poisonous. Wear gloves and wash your hands when pruning and taking cuttings to be sure you don’t accidentally ingest the sap. It can be fatal if eaten. (Spathiphyllum selections): A popular low-light houseplant, the peace lily is toxic only if large quantities of the leaves are eaten. (Philodendron selections): No other group of plants is as widely used indoors as philodendrons, but they are poisonous to humans and pets. Eating them can cause burning and swelling of lips, tongue, and throat; vomiting; and diarrhea. (Epipremnum aureum): A close relative of philodendron, pothos is just as easy to grow, but unfortunately causes the same symptoms of philodendron if ingested. (Cycas revoluta): One of the oldest living plants on earth, sago palm may have survived so long because animals don’t eat it. All parts of the plants, including the seeds and roots, are poisonous. Ingesting sago palm causes vomiting and diarrhea, and may lead to liver failure. (Zamioculcas zamiifolia): The drought-tolerant ZZ plant is a wonderful addition to low-light situations in homes and offices, but all parts of this plant are poisonous. Keep it away from children and pets, and wash your hands or wear gloves if you need to handle it. Another interesting fact about diseases is that plants can have two types of resistance: phenotypic or genotypic. Phenotypic resistance is when a cultivar is resistant to a disease in one location or part of the country but not in another. 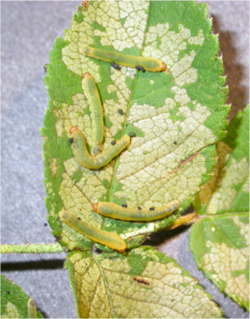 Genotypic resistance is due to the presence of genes that are not affected by climate, location, or horticultural practice. That is why, when the term “resistance” is used as a blanket term and assigned to a variety or class, it may or may not apply depending on where you garden. 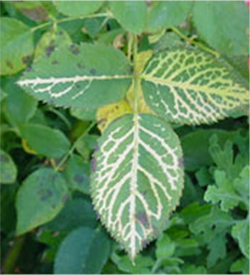 Rose mosaic is caused by a virus. 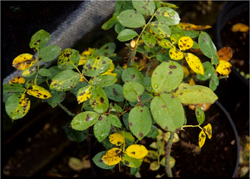 Bright yellow patterns made up of wavy lines may appear on the leaves of some varieties. Other varieties may show no yellow lines, but may be stunted and weak due to virus infection. Virus-infected plants cannot be cured. 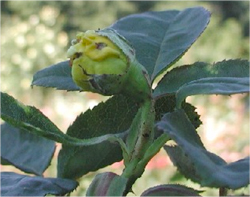 Plant virus-resistant roses if possible. 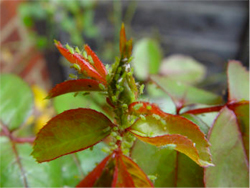 Try to control insects, especially aphids, since they help spread the virus. 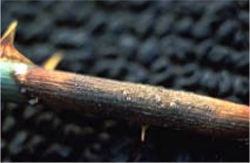 If you are pruning virus-infected plants, don’t prune healthy plants unless you first disinfest your pruners. Dipping the blades in a 10 percent solution of chlorine bleach and water for 60 seconds can do this. A 25 percent concentration reduces the time needed to about 10 seconds. 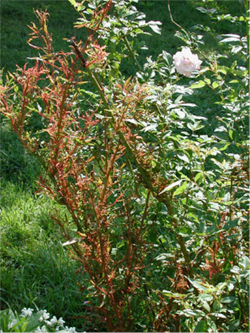 All infected plants should be removed and destroyed to reduce the spread of the virus to other plants. 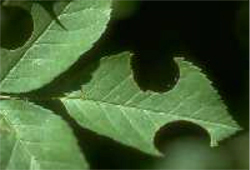 Rose rosette is becoming more common and can result in significant damage. 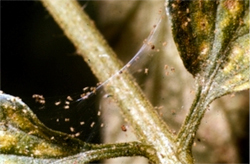 This pathogen (not yet positively identified) is spread by an eriophid mite. Symptoms include rapid growth of shoots, development of “witches’ broom,” development of tufts of small, deformed reddish leaves and excessive thorniness. 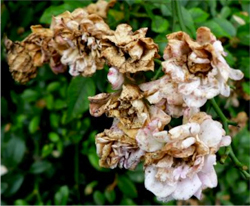 Plants decline over time. Because affected plants can’t be cured, it is best to dig out the affected plant and destroy it. 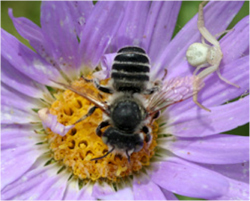 Controlling the mite has been labeled as an option but attempts at controlling it have proven inconclusive. It is very difficult to apply sprays in a timely and satisfactory way. From the sixteenth century on roses were carefully selected, bred and improved to form new rose varieties, especially in Holland. In the eighteenth and nineteenth centuries roses enjoyed resurgence in popularity, and many of the rose classics we admire today stem from that period. 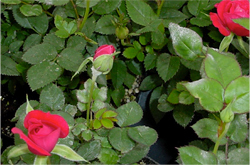 One of the ways to differentiate and identify roses is by their bloom type. Rose blooms can have different forms, which can be summarized as follows: single bloom, semi-double bloom, double bloom and quartered bloom.